A sinus lift may be necessary for patients looking to receive dental implants who lack an adequate amount of jawbone tissue. At Atlanta West Periodontics & Dental Implants in Lithia Springs, GA, Dr. Cheryl Cushman performs each sinus lift with a gentle approach, making sure you are comfortable throughout the procedure. Although this preparatory process will add a few months of healing to your treatment timeline, it can increase your upper jawbone density and improve your chances for successful implant placement. When an upper back tooth is missing or extracted, the sinus can expand and fill the space left behind by the natural tooth root. This inhibits dental implant placement, as the posts would extend into the sinus cavity. In order to prepare the upper jawbone for one of more implants, the sinus membrane must be lifted into its proper location, and the bone density must be increased. During a sinus lift procedure, the sinus is repositioned, and bone grafting material is placed underneath to support the sinus and regain adequate bone. Implants mimic natural dental roots to maintain a dense jawbone. 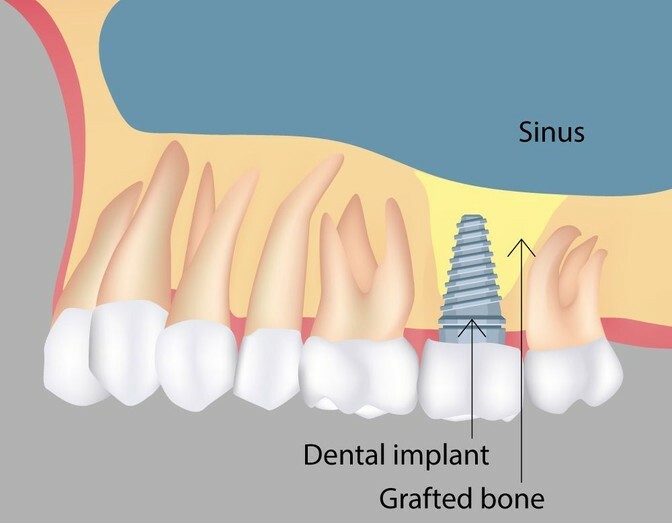 In these cases, a sinus lift procedure can restore your dental implant candidacy and allow you to benefit from this life-changing tooth replacement method. On the day of your sinus lift surgery, Dr. Cushman will administer local anesthesia for your comfort. We also offer oral conscious and nitrous oxide sedation for patients who feel especially anxious. Once the anesthesia has taken effect, a small incision will be made in the gums to access the jawbone. Dr. Cushman will carefully create a small window in the bone to access the maxillary sinus. Using special dental instruments, Dr. Cushman will delicately lift the sinus membrane up to its proper position. Once this has been achieved, the bone grafting material will be placed between the sinus membrane and your jawbone. After the graft is placed, the gum tissue will be repositioned, and stitches will be used to close the incisions and protect the surgical site. After your procedure, we recommend you go home and rest for the remainder of the day. Though you will most likely be able to resume normal activity the next day, exercise should be avoided for at least 48 hours. You will be given prescription medications and a list of post-operative instructions that will help with a successful recovery. Even if you have been missing teeth for years, you may still be eligible for implants with a sinus lift procedure. It is normal to experience some degree of tenderness and swelling for the first few days. Any discomfort can be addressed with over-the-counter anti-inflammatories, such as naproxen or ibuprofen. Swelling can be minimized with cold compresses, applied externally in 20-minute increments. Though you will be comfortable within a few days, complete healing takes approximately six to nine months. Dr. Cushman will see you for occasional follow-up appointments to check your progress. Once the area has fully healed, you can proceed with your dental implant treatment. If you are interested in restoring your smile with dental implants, schedule a visit with Dr. Cushman. Even if you have been missing teeth for a substantial amount of time, you may still be eligible for implants with a sinus lift procedure. You can call our office at (770) 739-5097 or contact us online anytime.